RENT: SCHOOL EDITION book, music and lyrics by Jonathan Larson. RENT: SCHOOL EDITION is the Pulitzer Prize-winning rock musical loosely based on Puccini's LA BOHEME. As described on the MTI show page, "it follows a year in the lives of seven friends living the disappearing Bohemian lifestyle in New York's East Village. AIDS and both its physical and emotional complications pervade the lives of Roger, Mimi, Tom, and Angel; Maureen deals with her chronic infidelity through performance art; her partner, Joanne, wonders if their relationship is worth the trouble; Benjamin has sold out his Bohemian ideals in exchange for a hefty income and is on the outs with his former friends; and Mark, an aspiring filmmaker, feels like an outsider to life in general, always behind the camera recording the events but never playing a part." A full plot synopsis can be found here. Why a RENT School Edition? Like all MTI School Edition musicals, RENT: SCHOOL EDITION comes with study guides and adapted vocal parts specifically written with student voices in mind. Additionally, because RENT has some content elements that have previously made it a difficult choice for some high school productions, MTI has worked with the Larson estate to create an adaptation that maintains the dramatic intention and integrity of the piece, while editing it to make it more appropriate for high school audiences and performers. The major change is the removal of the song "Contact". These changes exist to serve the greater message of the piece by allowing its themes to reach a wider audience. There are many reasons why RENT: SCHOOL EDITION is a wonderful show for schools to do right now. The cast of seven lead characters affords a high number of students the opportunity to perform, as does the presence of the chorus. Moreover, the diverse cast gives students of color a chance to play roles specifically written for them, which is not always the case in more traditional shows. However, one of the most important diversity elements in RENT: SCHOOL EDITION is the presence of gay and lesbian characters that are out and normalized in the piece. Doing a show like RENT: SCHOOL EDITION where all genders and sexualities are normalized helps create an atmosphere of acceptance in a school. As performers and audiences alike become attached to Angel, Collins, JoAnne, and Maureen through their humor, energy and great songs, they are able to see these characters as people instead of labels. And, when they see the characters this way, it goes a long way to helping them see their peers in a similar light. 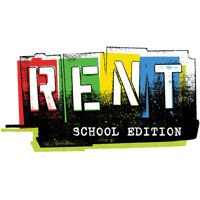 RENT: SCHOOL EDITION also addresses the issue of homelessness, which is a very pressing issue in America today (I talk about the benefits of a show spotlighting this issue in my post on LES MISERÁBLES: SCHOOL EDITION). One of the main plot points is the struggle to save a tent village in the East Village from the driving corporate force that sees profits instead of people. This, too, is an issue that many people struggle with as corporations gain power and everyday families have a harder time making ends meet. RENT: SCHOOL EDITION is largely a story of preserving community in the face of adversity, and the ability of friendship and love to conquer differences. That is a message that is timeless, and it's certainly an important lesson for high school students and community audience members to be exposed to. One of the most important aspects of RENT when it first opened was the way it dealt with the AIDS crisis, and how it made a point to humanize the face of those living with AIDS. While the country has come a long way in some respects to overcome the stigma of having AIDS and to prioritize curing and preventing the disease, there are still high numbers of people contracting and living with HIV and AIDS. (For some numbers from the CDC, click here.) Raising awareness of the syndrome is one of the most important ways to prevent its spread, but there is still a tendency to blame the victims for contracting it. A show like RENT: SCHOOL EDITION acknowledges that high schoolers are not too young to be thinking about AIDS. Furthermore, it creates likeable, sympathetic characters who suffer, and in some cases die, from AIDS, which helps humanize what can otherwise be a distant issue. Because we the audience (and other participants) care for Roger, Mimi, Collins and Angel, we are able to give AIDS a face that inspires compassion rather than judgment. RENT is a very popular musical nationwide. It ran on Broadway for almost 12 years and has had a number of national tours. However, up until now, producing it at the high school level was not just controversial, but often impossible, because of certain elements of content that are inappropriate for high school students and audiences. Given the important messages and lessons present in the script, not to mention the emotional attachment so many high school students have to the show, RENT: SCHOOL EDITION is a great solution to that previously existing problem. RENT: SCHOOL EDITION is a version of RENT that is very faithful to the original script, but that has been specifically designed with high school production concerns in mind. To get information about licensing or to hear SOUND CLIPS from the show, click here. To see PHOTOS or get information about COMMUNITY RELATED RENTALS for the show click here to visit MTI Showspace. EllaRC is a bookwriter/lyricist and musical theatre lover. She’s a new contributor to MTI Marquee - add her as a friend on MTI Showspace or check out her musical theatre and social justice blog, Stageleft.